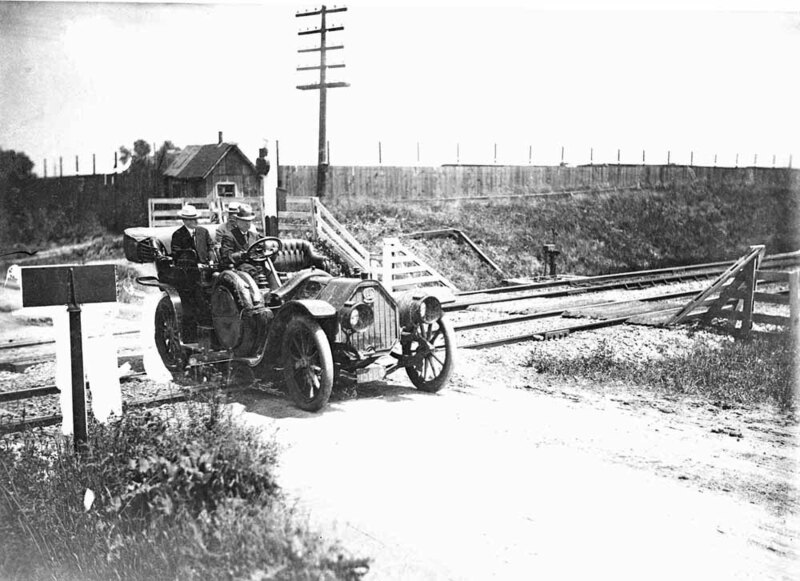 Two Ralston Steel Car Co. officials are being driven across the Columbus-Newark Subdivision at Cassady Avenue. The Ralston facility is behind the fence. Photo from the BJ Kern/Edward H. Miller Collection. 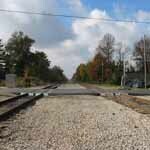 The rails heading east from Columbus to Newark, Ohio were jointly owned by the Pennsylvania Railroad and the Baltimore & Ohio Railroad. This 33 mile stretch was a bit like the waist of an hour glass. At the Newark end PRR trains from Steubenville - Pittsburgh and B&O trains from Wheeling - Pittsburgh shared the track. From the west at Columbus PRR trains from Cincinnati, St. Louis and Chicago came together on the Columbus-Newark Sub-Division along with B&O trains from Midland City-Cincinnati. The Columbus-Newark route had a formidable eastbound grade between Taylor Station and Summit Station. This part of the line was triple tracked so as not to delay the many passenger trains that used the route. In the 1950s B&O freights used a steam helper to reach Summit. The B&O passenger train while not requiring a helper did put on quite a show on the climb to Summit. By the early 1950s the PRR had dieselized both freight and passenger trains and didn't require helpers. In steam days the PRR did use helpers to Summit and sometimes they ran the second engine all the way to Dennison and even Pittsburgh. There were several small depots along the Columbus-Newark route, but no passenger trains stopped at any of them in the 1950s. Even during busy 1943 only one of twenty-three passenger trains, a PRR eastbound, made flag stops at four of the stations (Black Lick, Summit, Outville and Heath) and a regular scheduled stop at Pataskala. It was on the C&N route at Port Columbus airport, on the east side of Columbus, that the short lived transcontinental rail-air service, inaugurated in July 1929, made a passenger transfer from the PRR overnight train from New York to an airplane for the first daylight segment of the trip west. The PRR built platforms with an umbrella roof for the comfort of the passengers at Port Columbus. They even included a covered walkway across Fifth Avenue between the platform and the Port Columbus terminal. Moving forward to the early 1950s here is a sampling of PRR train action showing what you might have seen while railfanning along the C&N.